Starting to learn how to fly a drone can be scary for some. Some may even hold back from this because they’ve never done such things in their life. The drone company Yuneec, which is also one of the top companies in the game at this moment makes learning how to fly much easier. 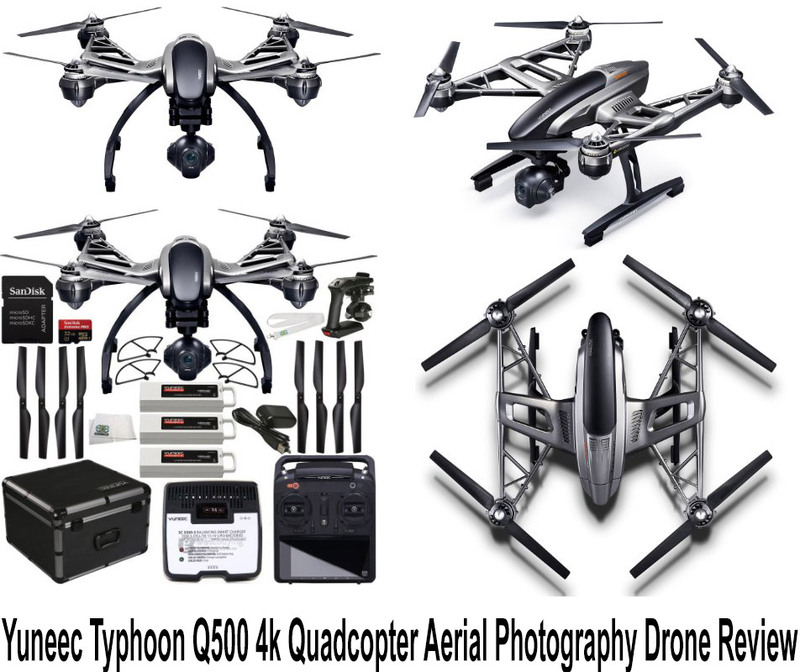 Today we will talk about the Yuneec Typhoon Q500 4K Quadcopter Aerial Photography Drone bundle. Out of the box you’ve got the drone itself, a little lens protector (used for protecting the screen on sunny days), a motor clam, four spare propellers, a charger (240V, with a bouncing charger on the bottom, ST10+ transmitter, CGO 3 Steady Grip, CGO 3 4K Camera, 2 spare 3S 11.1V 5400mAh batteries, one 1 X Cigarette lighter style car charger (so you can charge your drone directly from your car), 16 GB SD card which also comes with tutorials for the novice users and, of course, you will get the aluminium case so you can carry your drone safely wherever you want. 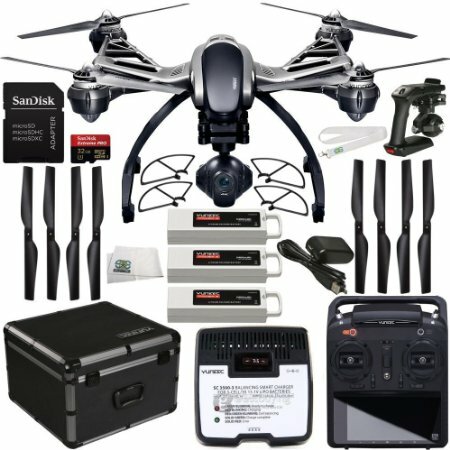 The Yuneec Typhoon Q500 4K can be the perfect choice for those who are new to the drones but want to buy a good quality drone as the drone is top notch quality and the learning curve is very accessible. The controls are fairly easy and the drone will return back if it flies more than 300 feet away from the controller. The drone also has a “follow me” mode which makes the drone follow the controller autonomously in a steady way from a safe distance. It also has the “watch me” mode which makes the drone focus the camera solely on the pilot regardless where it flies. You can make the drone return back to you with just a push of a button from the controller. This new version has new propellers, reinforced and much stronger than the original ones, it features a new color scheme, it has 2 landing gears which absorbs the shock making the landing much smoother and also protects the camera from touching the ground. Also at the back of the drone you’ve got the battery base so you can change the batteries quick and easy. The flight time is about 25 minutes, some users felt that the charging time is a bit too long but you can avoid that with the replaceable batteries. 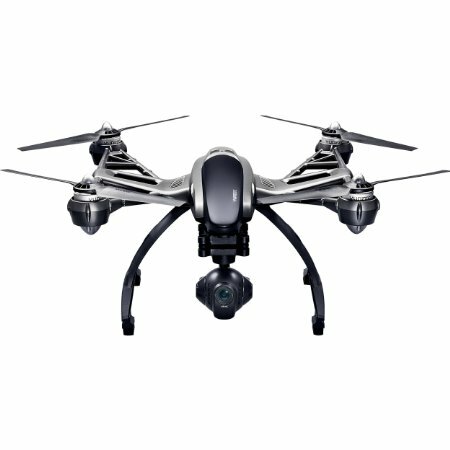 Probably the most anticipated thing about the Yuneec Typhoon Q500 4K Quadcopter is the CGO 3 4K camera. As the name implies the camera shots videos at 4K (1920X1080 and up to \120fps). The new camera is a 3 axis stabilized camera, has a digital video downlink opposed to the previous one which has an analog one, it is attached to a gimbal which helps it to avoid being hit with debris, dirt and stuff like that while making it look very nice, and it takes a lot of vibration helping you get smooth and stable video footage. Yuneec spent some time working on the color bounce making the colors look as natural as possible and also the camera has a non distortion lens as opposed to usual fish eye lens which will make your horizon look bent. The ST 10 is definitely a good improvement. Instead of having to use your tablet or your smartphone as the viewfinder you can use the controller’s 5.5 inch touchscreen display for that. Unfortunately there’s a bit of lag between the controller’s screen and the camera but for viewing telemetry data and taking shots the controller’s camera is perfect. The controller has special buttons and sliders for taking photo shots, video footage and adjusting the camera’s angle. With a switch you can change the flight mode: Smart, Angle and Home. The CGO 3 Steady Grip allows you to use your smartphone as the drone’s camera viewfinder. Basically you just take out the drone’s camera and then you connect it and your smartphone to the Steady grip and you can take steady shots on the ground. If you don’t want to use your smartphone with the Steady grip you can just use the ST10 transmitter. The price for this bundle is $1.030.